How many (used) needles are discarded in Sandy Hill? How many? For 2016, the short answer is 14,713. These are presumed to have been discarded by drug users. Seems like a large number. What makes it even larger is the context. The number of needles recovered in our Ward is 90% of the total for the whole city of Ottawa. Of course, Sandy Hill is only one part of the ward. There’s Vanier, Lowertown, and the Market, and the majority of needles are found in several spots that make up a small portion of the whole area. How do we know the answer is 14,713? Because the City counts discarded needles turned in from two sources: by City staff who recover some by responding to a 311 call, and by an organization called Needle Hunters. (The count of recovered discarded needles is found in Ottawa Public Health web pages). I first saw two needle hunters at work a few weeks ago on Daly Avenue. 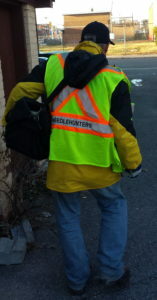 They wore high-visibility vests with NEEDLE HUNTERS written on the back. I had not heard of them before so I watched them for a little while before starting a conversation. They not only pick up used hypodermic needles but crack pipes and other drug paraphernalia—and they are all business. They never stopped scanning while we talked. The Needle Hunter program in Ottawa started in 1997. It is managed by Ottawa Public Health as part of their program on drug use that includes needle exchanges and used needle drop boxes. Causeway Work Centre, a not-for-profit company providing employment assistance to people with difficulty finding a job, trains and supervises the needle hunters. 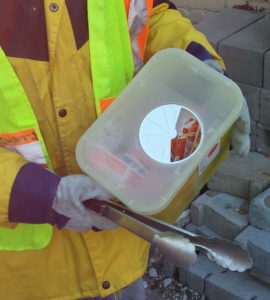 The Needle Hunters provide two services: they recover and dispose of used hypodermic needles and other drug material found in the streets and alleys of Ottawa. Also, the City, through Causeway, provides employment to people who have been unsuccessful in finding work matching their skills and experience. The Needle Hunters provide a first step on the employment ladder. Needle hunters walk routes in the centre of the city seven days a week for two shifts of 2 hours each day. They meet every morning and afternoon at a central location in the city and discuss issues and problems before each pair goes out to walk one of the seven routes. There are 24 locations identified on Lowertown Route A, eight of them in Sandy Hill. I arranged to walk Lowertown Route C with Kevin one afternoon. He moved quickly from one likely location to another, scanning all the time. I was only there for about 30 minutes of his two hour route but it was clear that I couldn’t have seen any needles or crack pipes or other paraphernalia at his speed. Kevin is a pro. Kevin typically finds 4-5 needles per shift. He found 25 the other day. The syringes have an orange plastic top that’s discarded when the syringe is used. If he sees one, he examines the grounds around the site very carefully, even looks into the nearby trees. There was an area that I thought might be good hunting but Kevin showed me windows that drug users stay away from, not wanting to be seen while injecting. 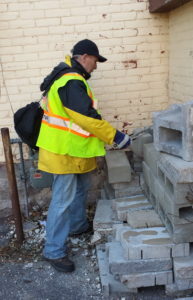 Needle hunters necessarily have to check out spots where injecting takes place but Kevin hasn’t been hassled nor does he think about any danger. “People are happy to see me,” he said. I asked about the strangest thing that he sees or has seen. He has occasionally seen two people in what I shall call a “compromising position.” I suspect that Kevin is fast enough that those people never even see him. Kevin and his co-workers only pick up discarded needles. Those drug users who are aware and care will deposit used needles in drop boxes or use a needle exchange. There are two drop boxes for needles in Sandy Hill: one at the fire station on Laurier and King Edward and another at the Sandy Hill Community Health Centre (SHCHC). There is a needle exchange at the SHCHC and another at Centre 454, and at least two drug stores on Rideau Street. If you discover used needles in the neighbourhood, use gloves or something else to pick them up that will protect you—like BBQ tongs. Put the needle into a non-breakable, puncture-proof container with a lid. (i.e. thick plastic bottle or tin can.) Do not throw it in the garbage—take it to one of the needle drop boxes as noted above. Sterilize the pick-up tool and your hands. Please report any used needles or other drug paraphernalia that you find to Ottawa Public Health at needlereporting@ottawa.ca and indicate the following information.